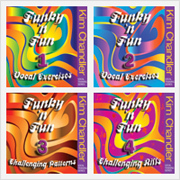 Kim has fronted a variety of live bands since 1984, performing everything from glam metal originals, rock, soul, funk, pop covers through to contemporary jazz. This stylistic breadth has helped to make Kim the enormously versatile performer that she is today. Kim ran her own function band in Australia and performed regularly for many of the top UK-based function bands over many years. She has performed at prestigious venues such as The Dorchester, The Lancaster, The Langham Hilton, The Savoy, Park Lane Hilton, Waldorf Hilton, Café Royal, London’s Guildhall, The Landmark, The Four Seasons, The Intercontinental, Grosvenor House, Banqueting House, Mandarin Oriental Hotel, Claridges, Lords, Blenheim Palace, Syon House, Madam Tussauds and a myriad of stately homes in the Home Counties. She has even performed with the Royal Marines on the Royal Navy aircraft carrier HMS Illustrious! In addition to regularly performing all throughout the UK, she has also performed abroad in places such as Moscow, Dubai, Rome, Vienna, Dublin, Dusseldorf, Marbella etc. Kim was invited to sing with the Royal Marine Band for a party hosted by the royal family for all of the combined royal households. This event was held in the grounds of Buckingham Palace in June 2006 with around 2000 invited guests and the royal family in attendance. 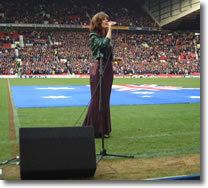 Kim was invited to sing live the Australian National Anthem at the opening match of the “Rugby League World Cup 2000” at Twickenham Stadium and when Australia made it to the final she was of course asked to sing it again at the final at Old Trafford to a massive stadium crowd of 60,000 and world-televised live on SKY and BBC. In November 2004 Kim was invited back to sing the Australian anthem gain at the Socceroos “Australia vs. Norway” match at Craven Cottage, Fulham, which was world-televised on SKY and shown live in Australia on SBS. Kim has supported the following Australian icons: Venetta Field, Grace Knight, John Paul Young, Marcia Hines, Tommy Emmanuel, Frank Bennett, Karen Knowles, Martin Lass, Rob Guest and Geraldine Turner.